The Department of Justice (DOJ) successfully prosecuted the Anti-Money Laundering case it filed against former Rizal Commercial Banking Corp. (RCBC) bank manager Maia Santos-Deguito. In a 26-page Decision, the Makati City Regional Trial Court Branch 149 found Deguito guilty beyond reasonable doubt of Violation of Section 4(f) of RA 9160 (Anti-Money Laundering Act of 2001). She was meted the indeterminate penalty of four to seven years’ imprisonment for each of the eight counts of the offense, and ordered to pay a total of US$109,520,046.63. In separate Informations, Deguito was accused of conspiring with other individuals for facilitating the over-the-counter transactions of several accounts “despite such irregularity and knowing also that the said amount form part of the proceeds of an unlawful activity.” The unauthorized activity involved the issuance by an unauthorized user of Bangladesh Bank (BB) Society of Worldwide Interbank Financial Telecommunications (SWIFT) payment instructions to the Federal Reserve Bank of New York (FRB-NY). 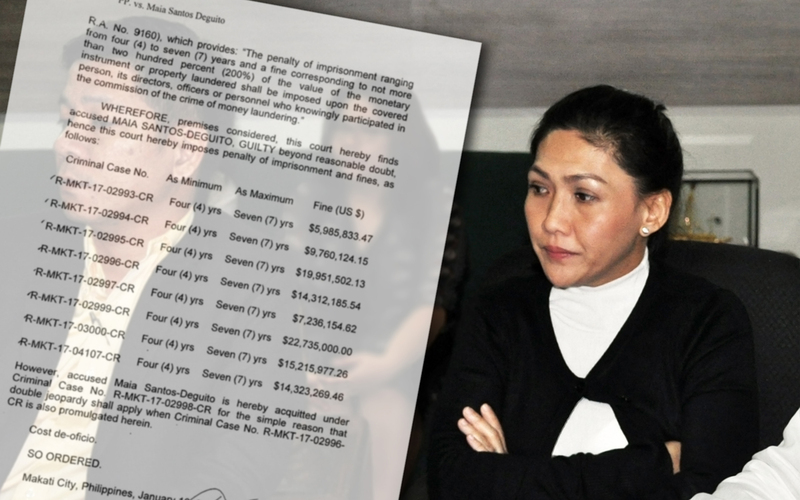 The Informations alleged that four of these payment instructions were cleared and credited to the RCBC, Jupiter Branch, of which Deguito was then branch manager. Go had denied authorizing the opening of the account. In convicting Deguito, the court found the prosecution’s evidence sufficient to prove the guilt of the accused beyond reasonable doubt. The criminal charges against other RCBC officials are currently pending before the DOJ.